The APW7008 is a high efficiency charge pump white LED driver; the device drives up to four white LEDs with regulated constant current for uniform intensity. The supply voltage ranges from 2.7V to 5.5V and it is optimized for a Li-ion battery application. The APW7008 operates in 1x, 1.5x and 2x charge pump modes and automatically switches the charge pump modes depend on the input voltage to maintain the required power for high power efficiency. The APW7008 provides up to 30mA per LED, for a total of 120mA and allows several methods such as a PWM signal on the CTRL0 pin for LED dimming. 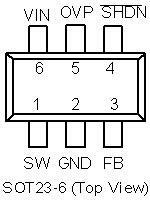 Three control logic pins allow to disable or enable a combination of LEDs. The supply current is only 2mA in 2x mode, and the EN pin allows the device to enter shutdown mode with 2uA quiescent current. The APW7008 switches at 1MHz frequency and only requires four 1uF ceramic capacitors and one resistor, and ensures low input current ripple and EMI. 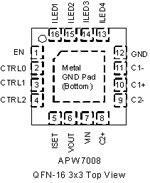 The APW7008 is available in a 16-pin QFN package. The APW7071 is a high frequency step-up DC/DC converter in a small 6-lead SOT23 package specially designed to drive white LEDs with a constant current. 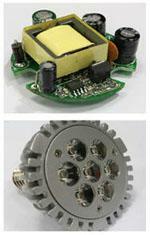 The device can drive up to 4 LEDs in series from one Li-Ion cell. The APW7071 is ideal for LCD panels requiring low current and high efficiency as well as white LED applications for cellular phone back-lighting. The APW 7136A/B/C is a current-mode and fixed frequency boost converter with an integrated N-FET to drive up to 8 white LEDs in series. The series connection allows the LED current to be identi ca l fo r un ifo rm b ri gh tn es s. It s lo w on -resi st an ce o f N-FET and feedback voltage reduce power loss and achieves high efficiency. Fast 1MHz current-mode PWM operation is available for input and output capacitors and a small inductor while m inim izing ripple on the input supply. The OVP pin monitors the output voltage and stop switching if exceeds the over-voltage threshold. An internal soft-start circuit eliminates the inrush current during start-up. 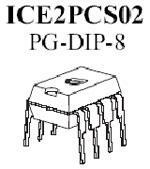 The APW7136A/B/C also integrates under-voltage lockout, over-temperature protection and current limit circuits. 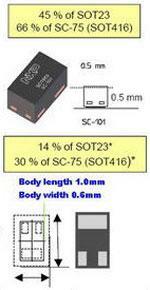 The APW 7136/A/B/C is available in a SOT-23-6 package. The APW7137 is a fixed switching frequency( 1MHz typical), current-mode, step-up regulator with an integrated N-channel MOSFET. The device allows the usage of small inductors and output capacitors for portable devices. The current-mode control schem e provides fast transient response and good output voltage accuracy. The APW7137 in cludes under-voltage lockout, current limit, and over temperature shutdown preventing damage in the event of an output overload. 6. Up to 1 MIPS throughput at 1 MHz. 4 - 25 Volt Operation. 基于节能需求日渐高涨, 近年来LED Lighting需求也相对的提升. 美国快捷半导体(Fairchild Semiconductor)针对LED Lighting应用推出了系列AC/DC PWM IC, 并针对不同规格需求提供相对应的Total Solution. 目前该设计已获多家专业制造商测试评估中. 英飞凌科技展示最新功率第三代的整合式多芯片功率集成电路系列，在切换式电源供应〈SMPS〉应用上的功率半导体领导厂商地位。这种新型的CoolSET F3 系列视应用上的需要而定，待机的耗电量比竞争品牌产品低了三分之一。CoolSET F3系列使SMPS制造厂商得以迅速设计出更轻、更具成本效益、可靠性高、效率佳的供电系统。其典型的应用，包括：DVD 录放影机、平板液晶显示器、数码动画摄影机、与笔记型计算机、以及其它可携式设备的电源转换器的供电.CoolSET F3系列有业界最低的待机耗电量，能够显著的达成这些方面上的能源节约. The device can be used in all applications that demand an efficient and cost-effective power supply solution from 75W up to 250 W. Notebook adapters can especially benefit from the high Integration level. The GreenChip™III is the third generation of green Switched Mode Power Supply (SMPS) controller ICs. The TEA1750 integrates a controller for power factor correction and a flyback controller. Its high level of integration allows the design of a cost effective power supply with a very low number of external components. Richtek 最新一代 notebook power solution, RT8205A 是一款针对具有内部3.3V与5V LDO的笔记型计算机系统电源双通道、同步降压控制器，采用COT架构在轻负载时可达到90%的高效率以及快速的瞬时响应。RT8205A对于噪音的部分提供了Ultrasonic mode可避开音频的问题. ・Smallest OD-CSP package in the world.